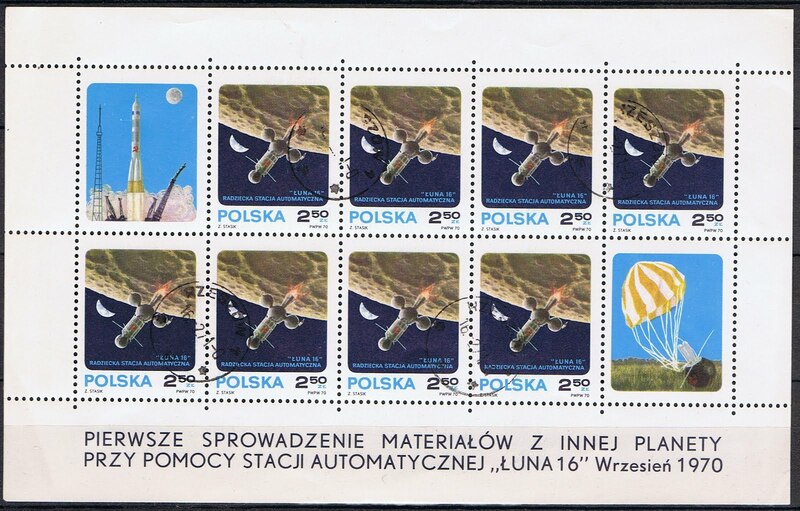 On November 20th, 1970 Poland issued a sheet of 8, 2.50 zloty, stamps to commemorate the Russian Luna 16 unmanned moon mission. Luna 16 was the first robotic probe to land and return from the moon with a lunar soil sample. It was the third mission overall to return samples (The first were Apollo 11 and 12) to Earth and the first for the Russian Space Program. 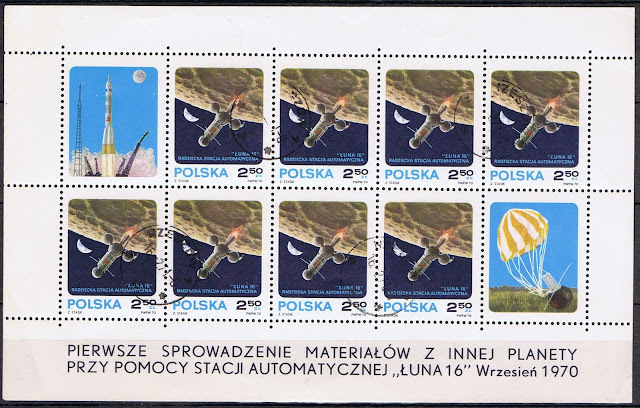 Launched from the Baikonaur Cosmodrome on September 12, 1976, Luna 16 started its descent to the Moon on the 20th of September 1970, it landed on the lunar surface approximately 100 km East of Webbs Crater, in the Sea of Fertility. Within an hour of landing the probe began drilling into the lunar soil to collect a soil sample. After reaching a depth of 35cm (13.77 inches), a soil sample weighing 101 grams (roughly the weight of king-size chocolate bar) was taken and placed in the probe.